There’s a lot of doom and gloom about the fate of big brands these days and specifically the threat of smaller, ‘insurgent brands’. So, I was interested to read The Grocer’s annual survey of Britain’s Biggest Brands. If you believe the headlines, all big brands would be in terminal decline. In fact, the top 25 brands grew by a net £54mill in 2017. In this post we seek inspiration from three of the brands that managed to grow in 2017, with an average growth rate of 3.9% being eight times the top 25 average: Coca Cola, Walkers and Nescafé. Coca-Cola returned to growth in 2017, with sales up £38m to just over the £1.1bn mark. The masterbrand strategy we posted on back in early 2016 seems to be paying off. This focuses investment on the Coca-Cola brand with the unifying campaign idea ‘Taste the feeling’, rather than spreading it over a collection of brands. This approach benefited the revamped Coke Zero in particular, which grew +£39million. 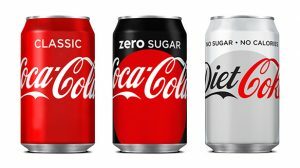 The product was renamed Coke Zero Sugar and backed with an improved product, media support and heavyweight sampling to drive penetration. Being clearly part of the Coke brand and having a more descriptive name clearly communicates that this is the taste of Coke, but without sugar. In contrast, previous marketing focused on the emotional ‘sizzle’ of Coke Zero, trying to give it a more macho personality, but failing to communicate the product proposition. 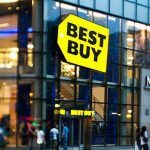 “We often pursued loftier concepts with the product sometimes playing a supporting role,” commented former CMO Marcos de Quinto. Another smart move was to kill Coca-Cola Life, launched in 2014 as an attempt to market a more natural and healthier Coke. I likened Coca-Cola Life to ‘watching your parents on a nudist beach’. Natural. But just not right. The total Coca-Cola portfolio has grown, despite the loss of sales from Coca-Cola Life, showing the benefits of focus. Together, Diet Coke (£421m) and Classic (£576m) added £6.5m in sales between them, in addition to the growth from Coke Zero Sugar. 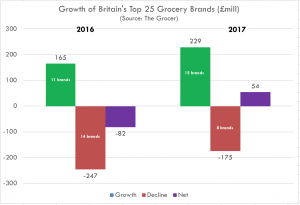 The growth of snack brand Walkers shows the importance of constantly revitalising the core product offer. 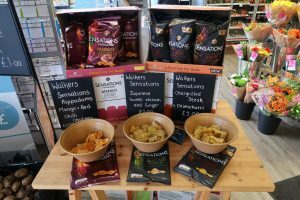 Growth was driven by a 16% surge in sales for its premium, flavour-led Sensations range to £102mill. 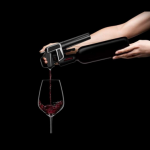 The Sensations range was upgraded in 2017 with a campaign base on the idea, ‘Sensations. A Feast For The Senses’. The campaign included TV advertising, digital support, a modern and stylish design and three new international flavours that cleverly surf latest food trends. These included Chargrilled Steak & Chimichurri and Japanese Sweet Wasabi & Ginger. Nescafé’s premium priced range extensions helped drive Nescafé sales up by £20mill. With Azera, Nescafé has tapped into the growing interest in ‘barista coffee’ served in coffee shops. The product is a blend of instant coffee and finely ground roast coffee beans, and sold in a distinctive tin compared to the glass jars for the main Nescafé offer. Azera is sold at a +65% premium per 100g vs. Nescafé Original and was supported in 2017 with a primetime TV campaign. The longer established Gold range, sold at a 17% premium, was also revamped in 2017 with new sleeker packaging. In conclusion, whilst big brands are still finding it tough to generate significant growth, the results from the Biggest Brands survey do give some encouragement. In particular, Coca-Cola, Nescafé and Walkers show the benefits of focusing investment, upgrading the core and using premium priced line extensions to stay in touch with emerging trends.